We know that 3D Printing has really gone mainstream when technology product giants like Hewlett Packard enter the market. 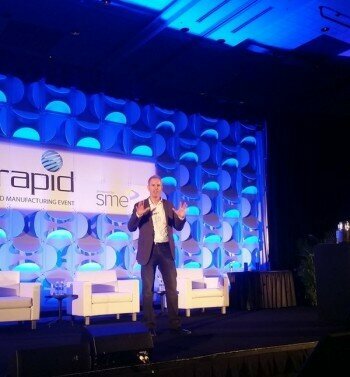 Today at RAPID, the Society of Manufacturing Engineer’s annual rapid prototyping and additive manufacturing conference, HP Inc. launched the world’s first production-ready commercial 3D printing system. 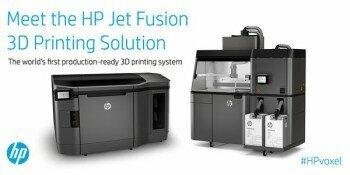 The Jet Fusion 3D Printing Solution has been a long-time coming and HP promises the 3D Printer delivers “superior quality physical parts up to 10 times faster and at half the cost of current 3D print systems”. 3D Printing has been limited by slow speeds which just can’t compete with traditional manufacturing methods. This, of course, is not a consumer machine. The new Jet Fusion printers are designed for model shops and 3D print service bureaus. HP has seen the challenge involved in such a R&D project and have collaborated with strategic partners, including Nike, BMW, Autodesk, Jabil, Johnson & Johnson, Materialise, Proto Labs, Shapeways and Siemens. Interestingly, HP is creating a 3D material app store and has started collaborations with certified partners including Arkema, BASF, Evonik and Lehmann & Voss, with plans to expand the open platform ecosystem over time. HP has also invited in software partners such as Autodesk and Siemens to make the design-to-print process easier and more intuitive. As you would imagine, these are not cheap machines, starting at $130,000. You can order one now, but delivery will not be made until late 2016. But it is exciting to see HP put the resources behind 3D Printing to make it ready for true disruption of manufacturing.